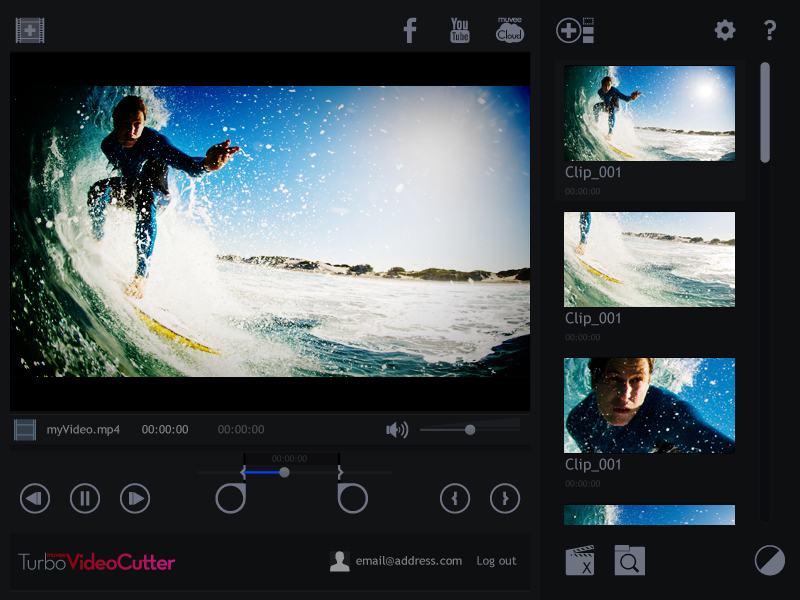 muvee Turbo Video Cutter is the quickest way to edit GoPro videos - create clips from GoPro video in just clicks. Turn ultra long HD video into short clips that everyone will want to watch. This trimmer captures amazing accomplishments: just set your start and end points, and create a clip. More than one incredible moment in your video? No worries - create as many clips from a single video as you like. Upload clips to Facebook, YouTube or muvee Cloud, or use them in your favorite video editing tool to make a presentation. 15 minutes on the ski lift for a 2min wowza double black diamond shred? Cut and Share that 2mins in 2secs! Transcoding and decoding? Life's too short to wait for that! More than one awesome moment in your clip? Keep them all with this video cutter! Create shareable video clips, with absolutely no quality loss, from GoPro HD video footage. Creating clips is simple and amazingly fast. Share your videos directly or send them into your favorite video editor to create a masterpiece. Turn your long HD footage in to manageable clips that everyone will want to watch. This trimmer is a must-have to capture those perfect moments. Highlight your segment, mark it, and trim it down immediately. Statement: First, please download the orginal installation package by clicking the download link. Of course you may also download it from the publisher's website. Using muvee Turbo Video Cutter crack, key, patch, serial number, registration code, keygen is illegal. The download file hosted at publisher website. We do not provide any download link points to Rapidshare, Hotfile, Depositfiles, Mediafire, Filefactory, etc. or obtained from file sharing programs such as Limewire, Kazaa, Imesh, Ares, BearShare, BitTorrent, WinMX etc. Software piracy is theft. If you like muvee Turbo Video Cutter please buy it.